At the City Council hearing on budget cuts to the libraries last Thursday, May 5th, Friends of the OB Library announced that they had collected over a thousand signatures in support of libraries and in opposition to cut-backs and closures. This was confirmed to me by George Murphy on Saturday, May 7th. Murphy is the President of the Friends, and he and I had a quick discussion when we briefly met the week after our little rally in front of the Library with Councilmember Faulconer. In fact, 1043 signatures to be exact, he said. The Friends had accomplished this by collecting signatures to their petitions by standing in front of the Library branch on Saturdays and out during Farmers Market on Wednesdays. There had been about 7 or 8 activists from OB, George said, at the Council hearing. Another thousand or so signatures had also been collected by Friends of the Clairemont branch library, he told me. George felt very good about what the organization had accomplished in shoring up support for the libraries with all the signatures. 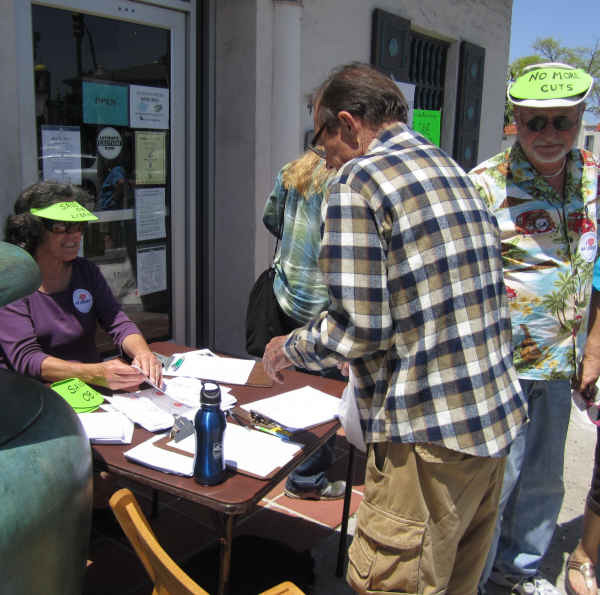 Now they’re not all from OB, George warned me, not all the signatures are by OB residents, as everyone knows that we get many visitors during Farmers Market days, he explained. Residents also rallied for library staffers. Anna Daniels said the city wouldn’t replace an attorney in the city attorney’s office with a volunteer. “I want to volunteer [there],” she quipped. Anna is our resident library activist, former City librarian, and writes frequently on such issues. Anna is very concerned with this “volunteer-thing” that certain Council members are pushing, suggesting that the libraries can be run with volunteers. Councilmembers Zapf and DeMaio are pushing the idea. “We have to be vigilante,” Anna told me by phone, when I called her for a brief update from her about last Thursday’s hearing. When I told her the Friends of the OB Library won’t be meeting in May because some of its leaders are going out of town, she sounded alarmed and said that library activists cannot drop our guard right now. She fears an attempted end run by politicians who say one thing, but do another. Anna doesn’t know what the end game is what with all these public pronouncements by politicians that everything will be all right. “Ocean Beach is leading the way for libraries, again,” she said, as supporters at other libraries around town haven’t done as well or haven’t gotten their petitions together. “We’ve got to keep the pressure on,” Anna said in ending. Older Article: Is Christine Kehoe testing the water for mayor?